The Michigan were on fire this weekend, winning the high-profile Quad meet even though perhaps the best Wolverine swim didn’t even garner them any points. Post-grad distance man Connor Jaeger crushed his own pool record in the post-grad exhibition 1000 free to highlight the day for the feisty Wolverines. Meanwhile the Texas Longhorn women came out on top, beating a tough Michigan team at home and also topping Louisville and Indiana. Michigan got stung by the DQ bee on night 1 of the Quad, but got their act together in a big way to win both relays Saturday morning. That started with a huge 1:26.96 in the 200 medley relay off the bat. That stands up as the top time in the nation by eight tenths of a second. The big struggle for Michigan’s medleys last year was finding a backstroker, but current freshman Aaron Whitaker filled that gap with the fastest backstroke split of the field at 22.41. His teammates were equally impressive: Bruno Ortiz was 23.95 on breaststroke, among the first guys we’ve seen crack the 24-second barrier so far this season. Dylan Bosch split 21.21 on butterfly and freshman Paul Powers went 19.39 on the anchor leg. Jeremy Raisky split 21.00 on the butterfly leg of Michigan’s B relay, faster than Bosch’s split. Richard Funk almost went 23 on the breaststroke leg for that team, putting up a 24.02. Joseph Schooling, the highly-touted freshman for Texas, split a blistering 20.82 on the medley. But in a situation familiar to Texas fans as well as Wolverine ones, the team struggled on breaststroke and faded to 6th overall. Texas sophomore Jack Conger was all over the 200 back, going 1:45.18 for the ‘Horns. That’ll be a tough event come NCAAs, but Conger has the talent to compete with the best of them, if he chooses to swim this event in the post-season. Louisville’s Grigory Tarasevich was fast, going 1:46.30 for second. That sent Texas on a run that would span the rest of the individual events. The 100 free showed off another Texas youngster, Brett Ringgold, who crushed a 44.11. The freshman trailed Indiana’s Anze Tavcar by just .02 at the 50 turn, but made up the difference to win by a tenth. Exactly one more tenth behind was Michigan’s Justin Glanda in 44.31. Texas sophomore Will Licon paced the 200 breast, using an aggressive front-half to beat Michigan’s senior Richard Funk 1:57.11 to 1:58.80. Aggressiveness really paid off for Licon, who went out a half second faster than Funk and still had the field’s best closing split. Once again, it was Texas that won the 500 free, getting a nation-leading 4:21.84 from freshman Jonathan Roberts. 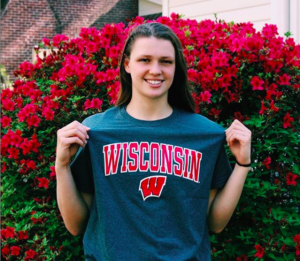 Roberts, part of that excellent recruiting class for coach Eddie Reese, beat a very good swimmer by nearly 5 seconds in Michigan junior and Danish national Anders Nielsen. Then in the 100 fly, it was the freshman Schooling who picked up the win, parlaying two fast medley relay splits so far into a 47.92 that kept the Longhorns streak alive by the narrowest of margins. Schooling beat Michigan’s Pete Brumm by .01 and Aaron Whitaker by .04. This race is pretty representative of how the meet went. Though it seems Texas should have been the clear favorites based on how many events they won, Michigan’s depth was overpowering, and their relay prowess basically made up everything they lost to Texas on the relays. For two teams that could be in the NCAA title hunt, it’s an interesting contrast is lineup styles at this early point in the season. The final individual swimming event was the 400 IM, where Texas’s Licon came back for his second win in a short time. Licon once again beat a Michigan swimmer in a tight finish, going 3:50.49 to eke out the win over Dylan Bosch’s 3:50.69. The only individual event Texas didn’t win went to a former Longhorn. NCAA champion diver Michael Hixon, transferred to Indiana, won on 3-meter, scoring 394.45 points. Indiana’s other stud diver, freshman James Connor, didn’t compete in this event after taking 3rd on 3-meter. Then it was the 400 free relay, where Michigan rose back to the top, nipping Texas by half a second to ice a hard-fought win. The back-half came up clutch for the Wolverines, with freshman Paul Powers throwing down a 43.46 and Bruno Ortiz finishing in 43.3. Texas tried to match with a 43.3 from Jack Conger, but again weren’t quite deep enough to match Michigan’s squad. The Wolverines finished in 2:55.47, Texas in 2:56.12. Indiana took third but had the best leadoff split in Anze Tavcar‘s 43.88. They led the first 200 before giving way to Michigan and Texas over the back half. Michigan came out on top in the 4-way dual meet, beating all three opponents. Texas topped Louisville and Indiana, and Indiana beat Louisville by 20. The women’s meet was almost the exact opposite story for Texas. Though Indiana and Michigan battled for most of the event wins, the Lady Longhorns were patient and deep, and ultimately wore down their opponents to win on a late run that saw them win 2 of the last 3 races. Texas started out on top, though, winning the 200 medley relay. The Longhorns actually trailed until the very last 50, when freshman anchor Rebecca Millard busted out a 22.63 to bring the team back for the win. Gretchen Jaques also had the field’s best breaststroke split at 28.07 to help the team go 1:40.81. Michigan jumped out to the early lead on Ali DeLoof‘s 24.72 backstroke split, but it was Louisville who took control by butterfly, getting yet another huge butterfly leg from star junior Kelsi Worrell (23.46). Louisville ultimately took second at 1:41.32 and Michigan went 1:42.12 for third. In the 200 back, defending NCAA champion Brooklynn Snodgrass was the clear-cut best of the field, going 1:53.29 and erasing most of the drama from the race by the 100-mark. Michigan’s stud freshman Clara Smiddy was second at 1:55.78. Michigan struck back in the 100 free, getting a 50.03 from DeLoof, who recovered enough from that medley relay to pick up the win over fellow medley relay swimmer Worrell from Louisville. Worrell was 50.16, and Texas freshman Millard took third in 50.50. Gretchen Jaques put Texas back on top with a win in the 200 breast, going 2:13.85. That was enough to best a pair of frosh – Michigan’s Emily Kopas (2:14.46) and fellow Longhorn Bethany Leap (2:14.71), who were two of the best breaststrokers in last year’s entire recruiting class. 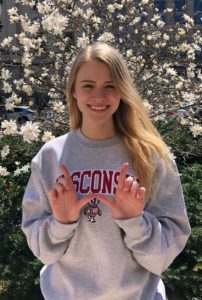 The 500 free went to Indiana freshman Kennedy Goss, who is looking like a great recruiting pickup for the Hoosiers. Goss went 4:46.92 to beat yet another freshman, Gillian Ryan of Michigan, in what was a very good meet for each team’s first-years overall. Ryan was 4:47.32. After absolutely crushing the butterfly legs of each medley relay, Louisville’s Kelsi Worrell was a bit off that kind of dominant speed in the 100 fly, but still had plenty enough to win. Coming off the 100 free just a few events earlier, Worrell was probably a bit fatigued, and went 53.46. That won by over a half-second, but is still well off her nation-leading 52.12 from last week’s SMU Classic. The last swimming win for Texas came in the 400 IM. Louisville’s Tanja Kylliainen blew away the field, but was disqualified during the race, nullifying her 4:11.64. That left Longhorn Madisyn Cox as the top finisher at 4:14.51, more than four seconds ahead of the next-best swimmer, Indiana’s Dorina Szekeres. Further icing their win, the Longhorns went 1-2-3 in 1-meter diving, led by senior Emma Ivory-Ganja‘s 301.85. Following her were Meghan Houston and Murphy Bromberg in a huge point swing for Texas. That was good for Texas, since Indiana and Michigan swept the top two spots in the 400 free relay. The Longhorns led early on freshman Rebecca Millard‘s 50.26, but Indiana roared back on a 49.97 from Brooklynn Snodgrass. Then it was Michigan’s turn to shine on the third leg, with Ali DeLoof putting up the field’s best split at 48.70. But Hoosier freshman Grace Vertigans closed in 49.96 to give Indiana the win in 3:20.45. Michigan took second in 3:21.53, while Texas went 3:22.08 for third. Other splits sub-50 seconds were Texas’s Tasija Karosas (49.82) and Indiana’s Haley Lips (49.85). That means three of the four Hoosiers cracked 50 on the relay, and leadoff swimmer Kennedy Goss was 50.67 without the aid of a relay start. Texas ultimately walked away with three big-time wins, while Michigan narrowly beat Big Ten rivals Indiana for second place by just 5 points. Indiana and Michigan both topped Louisville. The Quad Meet also featured some big-name alumni from all four programs who are still competing on the professional level. 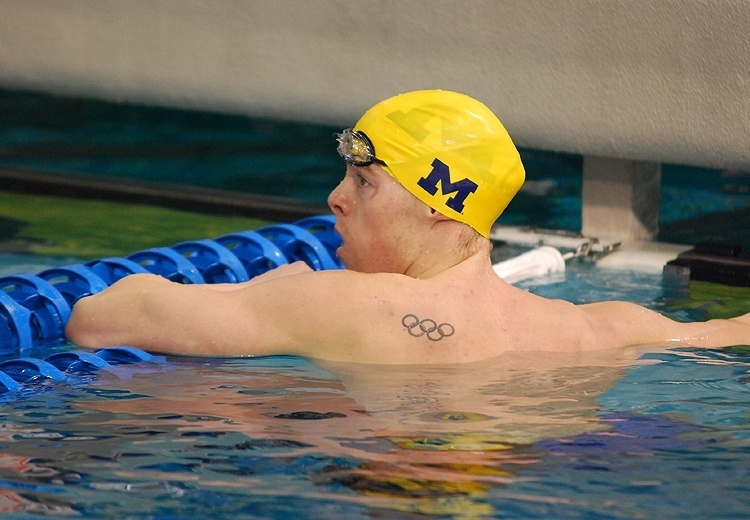 No swim in the meet was bigger than Michigan grad Connor Jaeger‘s 1000 free, in which he hacked 6 seconds off his own Canham Natatorium pool record. Jaeger was 8:41.09 as he begins his first full season as a professional swimmer. Also notable in that race was that Jaeger beat Texas pro Michael McBroom, who is one of Jaeger’s biggest competitors on the national distance scene right now. McBroom, a former NCAA champ just like Jaeger, was 8:57.04 for second place. 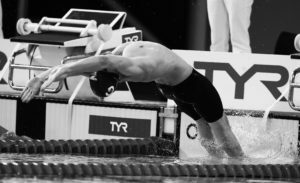 Other notable results: Brazilian national and former Louisville NCAA champ Joao de Lucca crushed a 42.60 to win the 100 free. Indiana pros won both the 100 breast and 200 back, with Cody Miller taking the former in 52.84 and James Wells going 1:42.90 to win the latter. 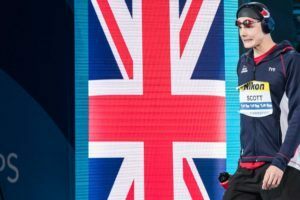 Only two women’s races went off for the post-grads. Indiana’s Lindsey Vrooman beat Michigan’s Emily Brunemann for the 1000 free win, 9:39.49 to 9:46.06. The 100 breast went to first-year Indiana pro Bronwyn Pasloski in 1:00.81. Texas nearly won without several of its studs and keeping some key guys off of relays. I have a feeling we’ll get a better idea of how competitive Texas is once their mid-season invite rolls around. Michigan won even with their winning 400 medley getting DQ’d, I’d say it’s a solid win. Never said it wasn’t a solid win for Michigan. In fact, I’d say it was a great win for Michigan and was a great showing for some of their freshman. I only made the comment to put things in perspective. It would be akin to Michigan nearly winning without Bosch, Funk, and Glanda. 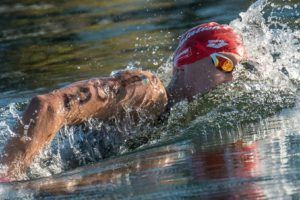 I noticed Evan White didn’t swim any individual events!? sick? injured? academics? he is a canadian stud and I think michigan’s most talented frosh. He did swim. He swam the 200 Fly and 200 I.M. Just didn’t put up blazing times. Jason Chen though, their fastest returning backstroker from last year hasn’t swam the past two meets… not sure what’s up. Michigan won by a lot more last year so it is safe to say it doesn’t mean much. The relays for Texas were not even loaded. Everybody forgets that John Murray actually swims the breast leg in the 200 Medley at NCAAs but never does it during the season. Several of their point scorers did not swim. On top of all this, everybody saw the advantage Texas has by not having to rest at all for their conference meet and can focus entirely on NCAAs. Oh and Texas was undefeated in any event Will Licon swam. Its coming down to Texas vs Cal again. So are dual meet victories. I was startled to see Jaeger going 8:41, especially in October. 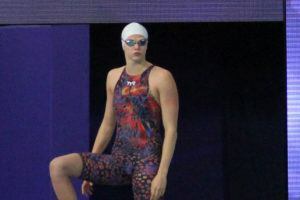 If the US Swimming website is up to date, that is the 2nd fastest swim in history only behind Vendt’s AR of 8:36.4 which was done in 2008 in a tech suit. Thought Texas men would have easily beat Michigan. These results surprised me. Must have been a great meet!! !